To visit Georgia in the Caucasus was one of the wildest adventures of my life. The hosts wanted to show us best of their hospitality. It included spontaneously scheduled excursion to some long-lost part of the country via bad roads through the mountains, headed for an unknown destination. In one little town the organizers left us and went to make some further arrangements. While waiting in some uncertainty as to what would happen next there was only one relaxing activity: taking photographs. We got out our automatic tourist cameras in the belief that we were spending our time usefully. 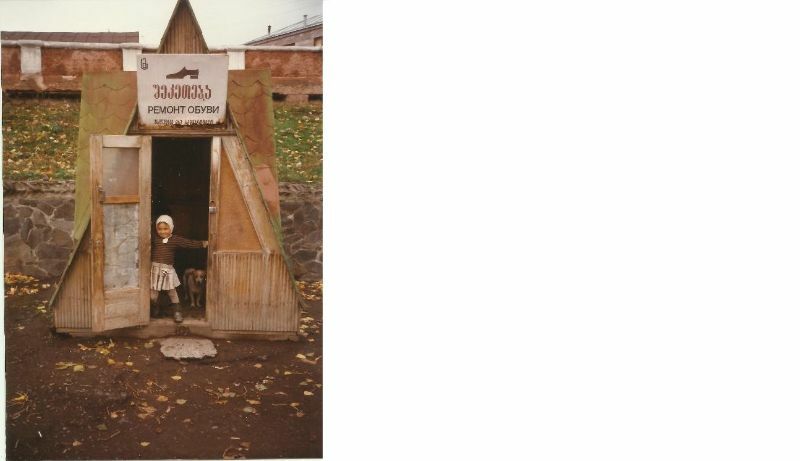 We were particularly attracted by a nearby shabby wooden hut with the inscription – SHOE REPAIR. It wasn’t as interesting as the little girl and the little dog on its doorstep. They were both filled with childish curiosity when they saw us. We had taken a few photographs when, from out of nowhere, we heard Russian, spoken with a Georgian accent. Why this unknown local should pick me out as a Slovak is a mystery I‘ll never be able to explain until the day I die. But in hope of a reasonable explanation I told him it was me. I knew I was in trouble. In the hut with the SHOE REPAIR sign there might be a cripple – it’s normal in this craft. I didn’t see him; didn’t know he was there. But it was pointless to apologize. The man was absolutely certain that he was well within his rights to teach a foreigner a lesson and he knew, as I did, that he could rely on the solidarity of his street companions. Cripples and children are untouchable in every country. Woe betides any foreigner who makes such a mistake – as I had, however unwittingly. As it happens in these moments, those who could have helped me stood around silently in anticipation of how this impromptu drama would conclude. The unknown man’s acquaintances started to form a circle around me and cocked their ears for what was to follow. Every word was important. And I realized that I should speak about anything besides cripples. If I did, I would give him the chance for a dissertation on the arrogance and insensitivity of foreigners. I began carefully. „Are you serious?” He looked at me in surprise, but also with suspicion. He knew that I was pushing him off the mark by moving to another subject. „Really? !” the man exclaimed with delight. It always pleases these opinion-makers of the streets to find out something from foreigners, that gives them a feeling of superiority. „Yes, you’re right,” I eagerly agreed. „Where is the world going?” he continued. But for a moment he didn’t want to let go of the possibility of a quarrel and started to censure me. He made a sweeping gesture around the square, which didn’t have anything especially nice about it. Thanks to this gesture, however, I saw that the circle of the curious was leaving out of boredom. I had won, but had to continue to stoke his pride with strategic compliments. „I’m waiting with shooting for your beautiful mountains,” I assured him. When I came home I revealed this story, from great strife to a happy ending, to my wife. She wasn’t interested in my rendition of the story, nor in the powers of my shoes. I looked at my beloved shoes and I almost had a heart attack. They were split completely open at the soles. When I stood in front of the Georgian shoe repair shop and had this war of words with the unknown man these shoes had to have been in similar shape. But I didn’t surrender. At the shoe repair shop in our neighborhood they immediately dismissed the idea of fixing my shoes. I remembered this utopian idea, but now we have capitalism again. Or not?